Italy made it two wins out of the two at the start of the Euro 2020 qualifying campaign to top Group J as they hammered Liechtenstein in Parma. 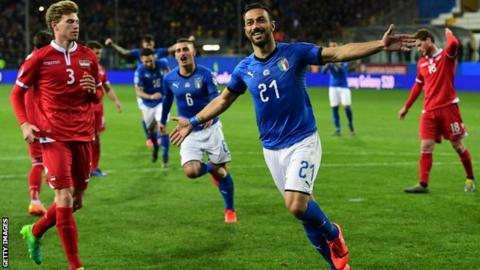 Stefano Sensi and Marco Verratti netted before Fabio Quagliarella became Italy's oldest international goalscorer at 36 with the first of two penalties. Daniel Kaufmann saw red for his handball to concede the second penalty. Moise Kean added a fifth 20 minutes from time before debutant Leonardo Pavoletti completed the scoring. Juventus forward Kean, 19, has scored two goals on his first two competitive starts for Italy, also getting one in the 2-0 win over Finland on Saturday. The Azzurri, who had 41 shots in the match, 12 of them on target, are the only side in Group J with a 100% win record and lead Greece by two points. Liechtenstein, ranked 181st in the world, have managed only two wins in their past 32 games. Livio Meier (Liechtenstein) wins a free kick in the defensive half. Attempt missed. Leonardo Pavoletti (Italy) header from the centre of the box is high and wide to the right. Assisted by Stefano Sensi with a cross following a corner. Attempt missed. Leonardo Spinazzola (Italy) right footed shot from the left side of the box is close, but misses to the right. Assisted by Marco Verratti following a corner.